- Simply and quickly add cellular connectivity to your own IoT hardware solutions. - BitPipe� Cellular DevKit offers an exciting and convenient way to evaluate and integrate BitPipe� cellular modems to your own IoT M2M solutions. No need to deal with difficult and time consuming regulatory and carrier certifications. Efforts can be focused on your desired end applications, save on development costs and rapidly get to market, or merely learn and gain a better understanding about cellular data connectivity. 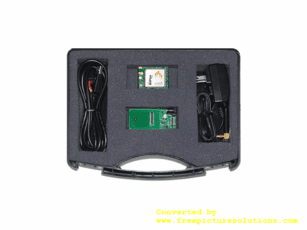 - Connect your PC directly to the included demo board and using the free BitPipe� test tool software, simulate sensor inputs, control outputs and communicate data or messages over the cellular carrier network. - Use the breakout board to interface the BitPipe� cellular modems directly to your baseboard solutions. BitPipe� modems provide the flexibility of operating in Autonomous mode without the need of an external host processor and can connect directly to sensor inputs and control outputs. In Transparent mode, the BitPipe� functions as a cellular data modem that can be connected to your own host processor baseboard solution. - BitPipe� Cellular DevKit is compatible with all interchangeable BitPipe� cellular modems, thus protecting your immediate or future IoT R&D investments.